Despite all this travel, some may be less than confident in their packing skills. That’s why we’ve compiled some tips from frequent travelers – including business travelers, avid hikers and students on-the-go – to make your trip as worry-free as possible. When you’re traveling, you may automatically assume you need to pack a suitcase. While hard-shell carry-on luggage can be the perfect blend of sturdy, secure and compact, it might not be the right bag for your needs. Consider a messenger bag, satchel or backpack for lighter, shorter or more minimalist travel. If you’re planning on hiking or camping, choose a heavy-duty waterproof or water-resistant backpack that maximizes back support and won’t rip under the weight of the contents. We’ve all been there. We get overambitious about how much we’re going to need and we overpack. If you’re the spontaneous type or tend to procrastinate when it comes to packing, maybe you’ve forgotten your medication, charger or toothbrush more than a few times. The type of trip – Your trip might be a week-long business trip, a day on campus, a weekend of travel photography or anything in between. It’s likely you will have specific items you simply can’t compromise on bringing, like a suit, notebook or quality camera. Try not to double up on items that serve the same basic function. 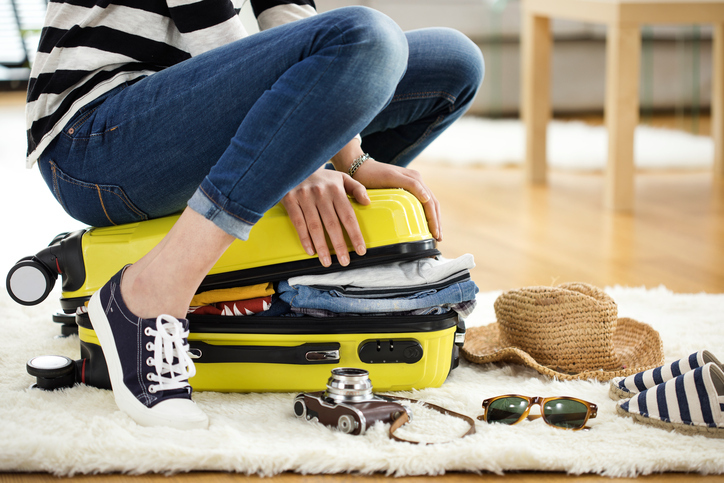 The length of time you’ll be away from home – This mostly affects how many items of clothing, toiletries and snacks you bring. However, evaluate the level of work you can realistically do in that time and only bring the supplies needed for that amount of work. Your usual habits – Be real with your own limits and tendencies. If you read only two books a year, do you really need to cram five books in your travel bag? If you aren’t a tech-heavy kind of person, make a checklist of your own before travel. For example, for a hiking, camping or survivalist trip, you may choose to bring a first aid kit and compass. These smaller items tend to roll around in a large bag. Store them all in a pocket or purchase a small pouch that you can clip near your bag’s opening for quick access. Now that you’ve figured out what to bring, you need to fit it all in your bag. Use these organization tips so you won’t be stuck riffling through your luggage in front of angry strangers waiting to check their bags. Roll your clothes – Rolling saves space and results in fewer wrinkles compared to folding. If you’re looking for wrinkle-free clothes, you can also try storing them in a dry-cleaning bag. Store small items in a GRID-IT! organizer – These organizers look like large rectangular boards covered in crisscrossing, stretchable elastic bands. You can slip smaller items between the bands, which hold them snug to the board and prevent them from slipping around. Everything is a container – Get creative with your definition of “container.” Shoes often have enough room to fit socks, underwear or toiletries inside. You can also repurpose containers sitting around your house, from old medicine bottles to mint tins to contact cases. These smaller containers will squeeze into the odd spaces in your luggage. Packing is enough of a hassle before your trip; you don’t want to worry about your vehicle, too! If you’re planning on traveling out of Dallas Fort Worth this holiday season, FreedomPark has you covered. Simply drive to the pick-up spot and one of our valets will take care of your vehicle for you, dropping it right back off when you come home from your trip. You can even sign up for text alerts and vehicle maintenance while you’re away. Call us at 866-727-5339 for more information!